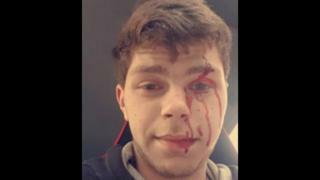 A driver who took a selfie after causing a crash that left a woman seriously injured has been jailed for two years. Connor Young, 21, crashed his car into Barry and Jennifer Fleming’s Audi TT near Falkirk. Young photographed himself in the driver’s seat of his vehicle following the collision. He was previously found guilty by a jury of causing serious injury by dangerous driving. Sheriff Simon Collins said it was “doubtful at best” that the Flemings would ever fully recover, and Mrs Fleming’s injuries were “life changing”. Mrs Fleming, 48, who now uses a wheelchair, sustained multiple injuries, including a compound fracture of the right ankle, and may still face an operation to amputate her right leg. Her husband Barry, 40, sustained a fractured sternum, collapsed lung, and injuries to his knee and shoulder. A trial at Stirling Sheriff Court was told the incident took place on the single-carriageway A833 close to the Falkirk Wheel in June 2017 as the couple headed back to Glasgow after a summer evening’s drive. The jury was told Young, of Bonnybridge, Stirlingshire, swung out to overtake near a bridge, crossing double-white lines. Mr Fleming said Young’s car had appeared in front of him on the wrong side of the road. Mr Fleming said he managed to get out, and pulled his wife’s door open. Mr Fleming said he looked over to where Young was sitting in his Renault Clio, holding his phone in front of his face.